US border agents held the gate open for the groom, who had tried to smuggle 133 pounds of drugs across a few months before. 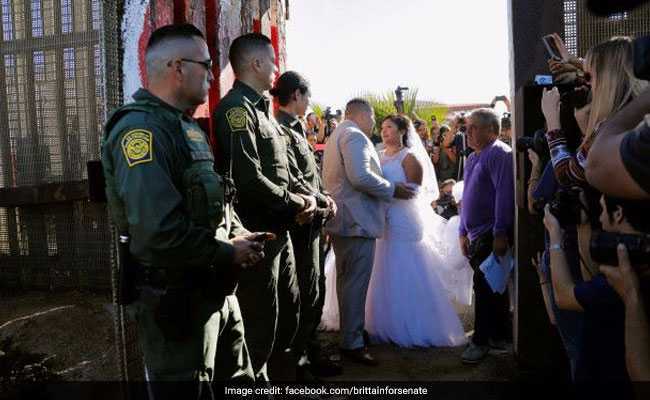 The ceremony was so lovely that even one of the stone-faced U.S. border guards cracked a smile as they held a gate open while an American groom and his Mexican bride took their wedding vows last month. From the Tijuana side of the wall: Evelia Reyes and her young daughter, each with white gowns but no visas. From the California side: a beaming Brian Zachary Houston, who earlier this year had been caught smuggling 133 pounds of meth, cocaine and heroin across this very same section of the border, and was out on bail. They wed and kissed inside the gate on Nov. 18. Cameras clicked, the crowd cheered. Then bride and groom returned to their respective countries and agents shut the metal door - as they do each year after letting a select few families briefly unite at a border they're forbidden to cross. Usually, there are no weddings at the annual hour-long border opening. Certainly, there isn't supposed to be a convicted drug smuggler. Now U.S. officials are struggling to explain how they failed to spot Houston's criminal record before allowing him to become the public face of a federally sanctioned open-border ceremony - a high-profile embarrassment when immigration tensions are already sky-high amid the Trump administration's crackdown. "Turns out we provided armed security for a cartel wedding," a spokesman for the local Border Patrol union told the San Diego Tribune. Houston's lawyer denied that the 26-year-old San Diego resident had been working for a cartel when he drove a Volkswagen stuffed with narcotics from Mexico to the San Ysidro border station in February. "He was basically a drug mule," defense attorney Russell Babcock said. "He's certainly not a cartel individual." He declined to say for whom his client was muling. In any case, the Jetta was so loaded down with drugs that a border agent could smell them wafting out of the trunk, according to court records. Houston's hands shook as he handed over the keys. Agents found package after package of heroin, cocaine and meth - inside the spare tire, the panels, all four doors. Houston pleaded guilty to three counts of smuggling in May, and expects to go to prison when he's sentenced early next year, his lawyer said. In the meantime, he had to surrender his passport and agree not to visit Mexico, where his longtime partner Reyes lived. "He was supporting her. They were separated by this unfortunate event," Babcock said. "Someone suggested, get married. He had no idea this was going to become an international story." And border guards had no idea what Houston had done when he showed up at the gate in Friendship Park, California, last month - with a tuxedo, priest and ring, and federal approval to walk through. Houston and his bride-to-be were one of 12 estranged families selected by the Border Patrol to meet inside the gate, which for the past six years has been opened for an hour before International Children's Day so loved ones can embrace under federal supervision. Border Patrol officials selected Houston from among dozens of applicants, according to Enrique Morones, whose nonprofit group partners with the agency to coordinate the annual event. He said his group, Border Angels, simply sends in a form listing the name and birth date of each applicant; Border Patrol is supposed to vet each one and come up with a shortlist. "Border Patrol has told us we don't want anybody with a criminal record to be allowed to do this," Morones said. Houston hadn't mentioned his, and he assumed the man had none when the government selected him. The government has not explained how Houston passed a background check. It's possible no one would have noticed had his surprise wedding at the border gate not created a media spectacle. "A wedding is outside the purview of why this partnership was established," a spokesman for Customs and Border Protection in San Diego said in a statement to The Washington Post. "It is also highly unlikely if the ceremony was requested that it would have been permitted." Morones had been as surprised as anyone, he said. The couple had merely planned to exchange rings inside the gate, he said, and then marry a few weeks later on opposite sides of the wall. "A Border Patrol agent said, 'Why is she in a wedding gown?' " he said. "Brian said, 'We're going to do it now.' "
He said the agent walked off and spoke on the phone to someone, then came back and said the wedding was OK. So after the other estranged families had taken their turns to hug, a row of border guards held the door open as Houston said his vows and embraced his new wife and her daughter. A press gaggle was on hand, and The Washington Post was among many national news outlets that covered the story. "I can't go there and she can't come here," Houston told reporters after the ceremony. "Hopefully very soon she can get a visa to come here, and we can be together." Only after the ceremony, the Border Patrol spokesman said, did officials discover Houston's conviction. 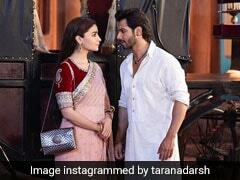 "The surprise wedding aroused agents' suspicions," he wrote. "As a result, database queries were completed after the ceremony that revealed Mr. Houston's arrest for drug smuggling. "This unauthorized event has now jeopardized future events and the continued opening of the border wall door," the spokesman wrote. Immigration officials have told Morones the same thing, he said, and he's now trying to persuade them not to end the gate opening tradition. Houston, meanwhile, had no idea his little wedding had caused a furor until the San Diego Reader published a story about his criminal background over the weekend, his defense lawyer told The Post. "He's very sorry the Border Patrol was put in this position, but he had no reason to believe they wouldn't know about this," Babcock said. "We thought it would be as simple as if they didn't want him to have this wedding or ceremony, he'd get a phone call." Now, Babcock said, both husband and wife are facing public backlashes in their respective countries, where immigration politics were already fraught over President Donald Trump's promise to wall off the entire border. The couple hasn't seen each other since the ceremony, and Houston is preparing to begin a prison sentence next year while his wife begins the long process of applying for a U.S. visa. The whole point of the wedding had been to ensure they could be together once Houston's drug bust troubles were behind him, Babcock said. Now it's unclear when and if they'll end. "It was supposed to be a story about love and his responsibility," Babcock said. "Now everyone's pointing the finger."